The game and the blog will have to wait. I’m trying to be positive, but it’s not working right now. I’m sitting in front of the lap top that I had to fight for! We put the kids to bed and by the time I made it down the stairs, I realized Jack was already in the basement watching the recorded game. The kids were still yelling, the kitchen floor was covered in food and the family room looked like three kids had gone wild in it five minutes ago. I took a look around and realized the bag of chips was missing along with the laptop. 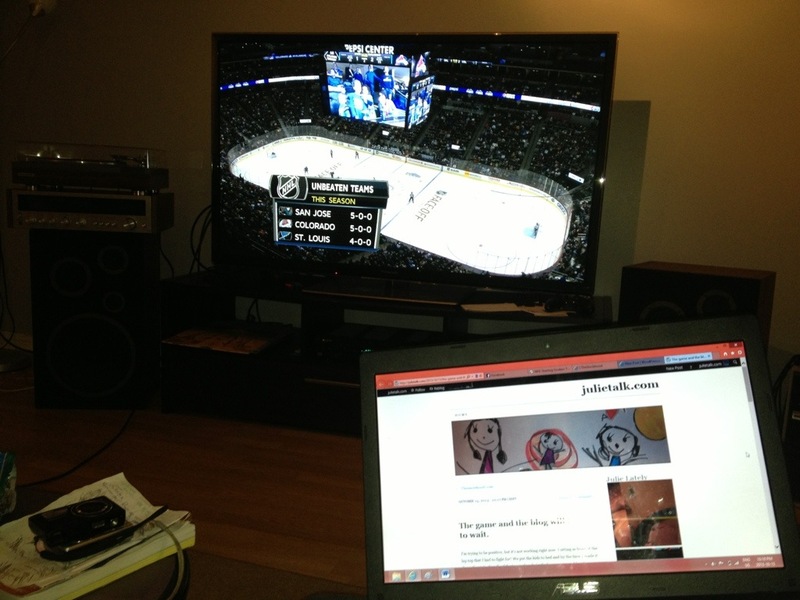 Jack was probably all set up downstairs, watching the game and checking his hockey pool with one hand, with the other hand buried deep in that bag of chips. When I finally made it to the basement I had to wrestle him for the laptop. As soon as I sit down to start a post, we hear A3 in the baby monitor. Now the silent argument starts. Who’s going to get up? We stare each other down, we’re both mentally cursing at each other. I got up. Went upstairs to find A3 rolled up in her blanket, holding the crib bars while looking out of them, like some kind of sad prisoner. We know the drill by now. Pull the crib forward of an inch, hear the pacifier fall, lie down flat on the floor, tap in all directions to feel the thing, grab it, rinse it, stick it back into her mouth until next time. I go to check on A1 and A2, A1 is asleep and A2 is standing in her crib. “I pooped in my diaper” she said. I know she didn’t poo, because if she did, let’s just say, you can’t miss it! A two year old eats, drinks and poops normally, if you know what I mean. Now, I’m not sure why she says that she pooped, does she confuse pee for poo? Or does she know we’ll definitely change her if its poo and that will give her a chance to escape the crib. I check her diaper, no poo. “It’s not poo, its peepee ” I tell her. “Go back to bed”. You wouldn’t imagine the number of times you say the words “peepee” and “Poopoo” in one day, when you have kids. I come back downstairs, the moment I sit down, we hear A2 crying through the monitor and now she’s woken A3 up again. “Your turn Jack”. Jack goes upstairs and 5 seconds later I hear him calling for me through the monitor. I go upstairs to find him changing A2’s diaper…she got him. I go attend to A3, while I hear A2 arguing with her father “I want mom!”. Jack and I switch positions. I take A2 back to her crib. So I take her towards the window and as I do I see the biggest smile on her face. She’s just happy she’s not heading to the crib. I show her the moon; explain to her that the sun is sleeping and that she should too… back to her crib. As I leave A2’s room, I see Jack leaving A3’s room. He’s talking about his 10 month old daughter. Imagine what will happen when she turns 15. We come back downstairs, and 2 minutes later, A3’s crying again. Who’s turn is it now? We figure, we should to let her cry for a bit, she has to learn. 5 minutes later, Jack can’t take it anymore and he gets up. I’m watching him right now through the monitor, he did the pacifier routine, and now he’s stroking her hair while gently talking to her. He went up, and it wasn’t necessarily his turn, to me, this is romance. Sure it’s hard with three kids, we don’t get a moment to ourselves, they drive us up the walls and we empty our anger on each other. But once in a while a little gesture is all it takes to show each other, that after all, we’re on the same team. She’s still crying, I better go up there and give him a hand.